You don't want to leave your furry family members behind if you don't have to. 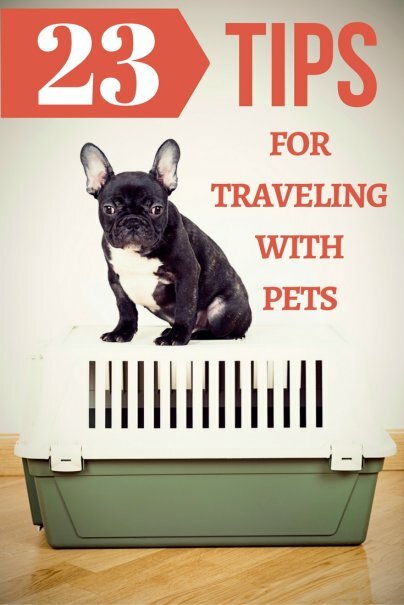 So here are 23 tips for traveling with pets to help you navigate the world of sticky border regulations, pet-friendly accommodation hacks, flying with pets, gear to make the journey easier, and much more. Before you take to the road with your pet, you'll want to cover the following basics. Lauren and Kenin Bassart of TheConstantRambler have been traveling the world full-time with their dog Zoe, a wiemaraner, since 2012. They find that traveling with a dog sometimes dictates where they can and can't go. "Different countries have different requirements. Many countries require quarantine periods and we avoid those when taking Zoe. Most countries require shots for rabies, bordetella (kennel cough), and parvo. Call an embassy and do your research online to see what the country's requirements are, and make sure to have your paperwork handy when crossing the border." You can research various country requirements at PetTravel.com. In researching pet travel requirements, consider both where you're going and where you're coming from. Gigi Griffis has also been on the road since 2012 with Luna, her pint-sized schnauzer-yorkie mix, who has 11 passport stamps and counting. She has a section for dog travel tips on her website Gigigriffis.com. "Countries (especially those with low incidence of or no incidence of rabies) have requirements that vary based on where you are coming from. If you are coming directly from the U.S. or Canada, the requirements are often as simple as a vet visit, some paperwork, and a stamp from the appropriate U.S. or Canadian authorities. If you are coming from South Africa or Thailand, the rules might be different." It's not just about your last destination either, Gigi says even layovers in certain countries can affect your pet's ability to cross borders. You can find US requirements on the APHIS website. Health certificates are required by airlines, border authorities, hotels, pet-care centers, and others. In many cases you need to get your health certificate within 10 days of starting your trip. Research the specific requirements of your itinerary before visiting the vet, so they can include everything necessary in the certificate. Many hotels, travel operators, pet care centers, airlines, and customs and immigration agencies require a printed record of your pet's veterinary certificate. Instead of printing off reams of copies for every possible instance, just print off a couple and keep an electronic copy. Myscha Theriault is a best-selling author and internationally-syndicated travel columnist who travels full-time with her science journalist husband and giant Labrador retriever. With her electronic copy handy, she's always ready to produce her dog's health certificates as needed. "The hotel's business center printer allows me to print a PDF copy of our Labrador's shot records as required, for example whenever we need to book an afternoon of daycare for her from the road. It keeps the paper clutter down day-to-day, while still remaining prepared for last-minute changes in our schedule." Just in case something happens on the road, you don't want to be scrambling to find a reputable vet. Record the contact information for a few vets in the area you're visiting before you go. Instead of worrying about finding a specific brand of pet food or carrying bags of food across borders, Gigi focuses on the ingredients. "I usually carry enough food for a few days and then buy a bag of food when I arrive. Since different countries tend to have different brands, it's important that you know what ingredients are in your pet's food. Instead of trying to find your brand, look for a food that has the same basic structure. If you feed your pet something with chicken and grains (the majority of dog foods), look for chicken and grains. Even switching brands, I find that Luna's digestive system does fine if I stick with the right ingredients." You don't want to overdo it, but having a little kit to care for your pet can prevent you from scrambling for something at the last minute. Pawfriendly has some good suggestions for what to include in your pet's first aid kit. Flying with pets isn't particularly easy for either the pet or the owner, but it certainly isn't impossible. Here are some tips to make the process smooth. Airlines have differing regulations for traveling with pets, such as pet carrier dimensions, required health certificates, etc. Always check with the airline for their requirements before you book. You can view various airline requirements here, but you should still call the airline to confirm that their rules haven't changed. Your pet should be able to stand freely, turn around, and fully lie down in the carrier. Cats, who are especially prone to stress when flying, can be calmed with special sprays designed to reduce feline anxiety. For dogs, there are supplements that do the same thing as well as prevent motion sickness. Put a familiar towel/blanket or toy in the carrier with your pet to provide them with comfort and a sense of home. Cesar Milan (the Dog Whisperer) has lots of pet-friendly travel tips on his website. Among them, he has some good tips with regards to when and how to crate your pet. Don't leave anything in the crate (like leashes or loose collars) that can harm your pet. Don't treat the crate like a prison, for example by using a sad voice and saying things like "sorry" when you crate them. Fast your pet for four to six hours prior to crating them to fly, so they don't have a full stomach/bladder. Exercise your pet as close to departure time as possible. Crate your pet before entering the airport, which can be a stressful environment. If your pooch needs to travel in the hold, try to book direct flights. Clip their nails so they don't get caught on anything, and make sure you spend a few weeks getting your pet used to their crate before traveling to reduce anxiety. Also, carry a picture of your pooch (in case they're misplaced — yes, it happens), and notify the flight attendants/captain that you have a pet in the hold. The Humane Society website has some other good tips for flying with a pet in the hold, in addition to a variety of general pet travel tips. Myscha says La Quinta and Red Roof Inn are chains that typically take pets without a nightly fee. When there isn't one around, Myscha turns to tourism boards for suggestions. "We typically ask the local tourism board and visitor center for recommendations of the more unique spots. They are always way more in-the-know than even the most up to date [pet-hotel] website." Are there additional fees for checking in with pets? Are there any resident pets? (Depending on the pet, they could be problematic or a great playmate). Do you offer services for pets (anything from providing food/water bowls to pet-sitting services)? What are the rules and restrictions (for example are there certain areas I can and can't go with my pet)? Do you have rooms with easy access to the outdoors? Are there nearby parks where I can exercise my pet? "Having a resort where there are bars with outdoor access and tables or tie-on poles is a great perk for us," says Myscha. Her pup doesn't do well in restaurants, but can handle hanging out in an outdoor establishment. "Strolling downstairs when the venue isn't crowded enables us to at least have a drink outside of the room without having to book daycare for the dog." Gigi stays mostly in apartments through vacation rental sites like AirBnB. Instead of focusing on finding pet-friendly rentals, she focuses on making her dog a rental-friendly pet. (See also: How to Find and Book the Best Vacation Rentals). "I don't worry about whether the places are pet-friendly or not. Instead, I find four or five places I'd like to stay and reach out with a message that asks if they would be willing to make an exception for my dog explaining why she's an exception-worthy tenant. These reasons are that she is a non-shedding breed, small (about 12 lbs/6 kilos), therapy trained to work with kids in hospitals (and thus very well behaved), and has landlord references. For the most part, landlords and hotel owners are worried that pets will make noise, destroy something, leave hair all over the room, or bother other guests. If you can put these fears to rest, you have a chance of getting an exception." For Gigi, the key to having a rental-friendly pet is in producing references. "Almost nobody thinks about doing this, but it is endlessly helpful. Whenever you stay somewhere with your pet, ask the landlord or owner to mention the pet in their reference. It's a simple matter for the landlord and helps future landlords evaluate your exception request with confidence." Many pet-friendly hotels will assign you a first floor room (or even better, one with direct outside access), but it's always good to ask. Myscha always specifically requests a first-floor room. "Elevator or not, it's a pain in the neck to do midnight potty break runs with your pooch if you have to travel down several floors to do it." "When you check into your hotel room make sure to bring your luggage, your pet's food, and their bedding in immediately. The smell is comforting and the pet will feel more at home in the hotel knowing that there are things in the room that smell familiar," says Lauren. Once initially settled in, Lauren and Kenin continue the integration process. "We take a short stroll around the hotel and come back into the room 15-20 minutes later. This keeps separation anxiety at bay because they know we are not abandoning them. It also let's us know if they are going to bark or not when we leave for a longer period of time." Myscha uses the hotel mini-fridges to freeze a Kong full of peanut butter for times when they're tending to business and unable to pay attention to their dog. "This keeps her distracted during lobby meetups, or while we are unpacking and organizing the room." "The [single-serve packets of peanut butter] at the morning continental breakfast bar are great for filling in when you've run out of your travel stash, and they can also be used for administering medication pills without fuss," says Myscha. She adds that grabbing a piece of bacon or sausage or even some cereal can come in handy when you've run out of treats and there's no convenience store in sight. Going on a road trip? This is a much easier way of traveling with pets than flying, but there are still a few things to be aware of. Mary and Al Hone of Tales From the Back Road have been traveling full-time in their RV with their two dogs (Roxy and Torrey) for over two years. Despite traveling with all the comforts of home, they limit the amount of time spent on the road itself. "We try to not travel more than five or six hours per day. It's tiring for us, and boring for the dogs. We make frequent stops at parks, or somewhere we can play fetch, or just somewhere we can walk." Lauren says preparing the car helps to make their pooch comfortable, and alleviates their worries while driving. "She has a bed in the back of our VW with a blanket and her favorite toy. She is also harnessed and seat-belted so she is safe in case of emergency." Mary and Al are also sure to secure their dogs to keep everybody safe. "Torrey has a seatbelt harness, and Roxy has a car seat to keep them both safe as we travel. This also keeps them from being a distraction to the driver." "We have a portable doggie water bottle and make frequent stops to let her stretch her legs and hydrate," says Lauren. Mary and Al also ensure they have some food on hand for wonky driving schedules. "If we miss dinner time for the dogs, they know it and remind us. The treats keep them happy until we can stop and get them their dinner. They are also good for rewarding good behavior and patience." Have you tried traveling with pets? Leave your best tips and recommendations in the comments!